Copenhagen has amazing breakfast and brunch places to offer. The cafés are furnished in a super comfortable way, according to the Danish “Hygge” lifestyle, and the menus offer everything you crave, especially if you are into trend- and superfoods! 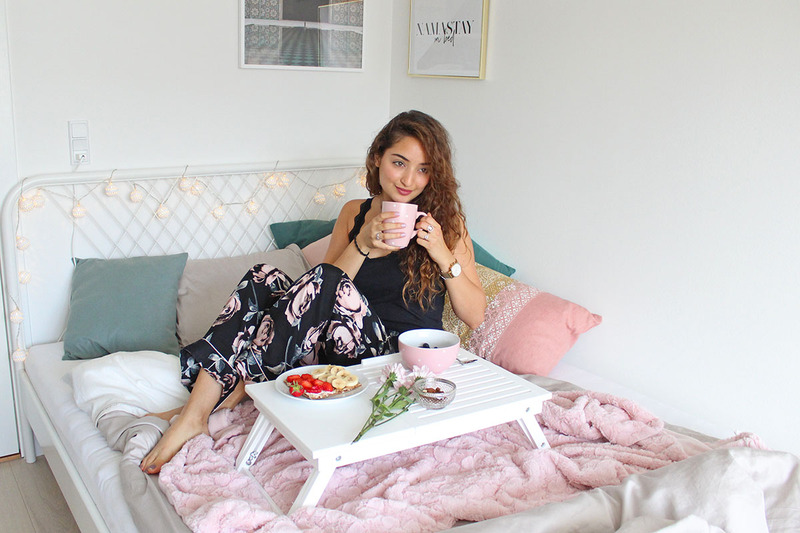 But often I ask myself, why go out to have brunch in a place that is made to look like home, when you can simply have an amazing breakfast in bed at your real home? After all, it’s not that hard to create your beloved hipster avocado on toast or muesli bowl yourself! 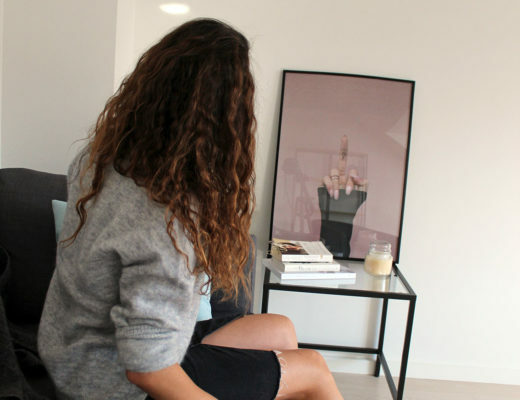 Since I moved to my first permanent apartment after a long while here in Copenhagen, I really enjoy staying at home and making myself comfortable. 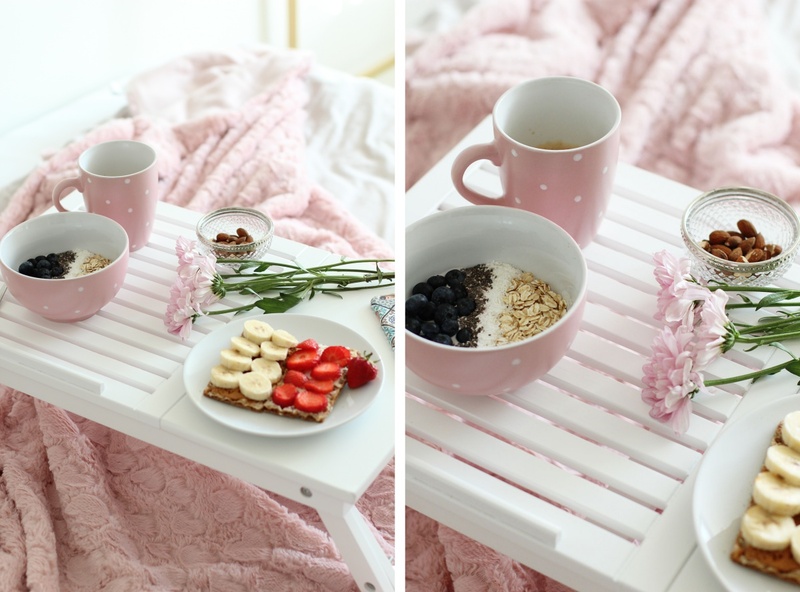 Since my roomie and I are big breakfast fans, we sometimes even create something like a luxurious Sunday breakfast in bed, while watching Netflix or reading articles for university…. the perfect start into the day! 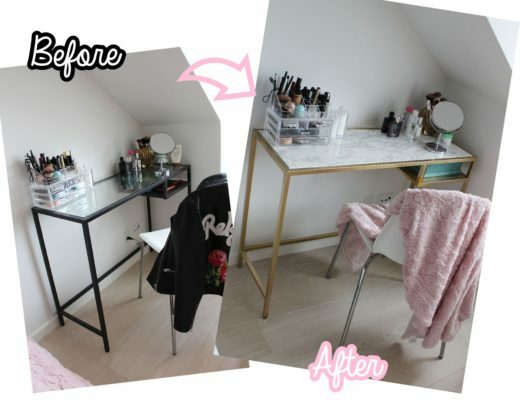 In collaboration with Wayfair I am sharing with you today how this looks like! The ideal bed for me is made out of a mattress that feels like cotton wool. It is covered with loads of pillows and sheets, wrapped in linen so soft, and is big enough to fully stretch out in all directions! Its colors also play an important role; I prefer a combination of plain, light colors. At the moment my bedding is kept in a light sandy tone, while the cover and pillows add some soft pastel colors. The bed linen from Schöner Wohnen via Wayfair simply feel amazing on my skin. I can really recommend paying attention to what your linen are made of – you will definitely feel the difference if you go for a better quality material such as 100% cotton. This is how you achieve a little 5-star-luxury feeling in your own bed! Fresh flowers also add so much atmosphere to the setting… even if you cannot eat them, their smell in the morning will for sure delight you! Oh, and don’t forget your favorite bowl and cup! 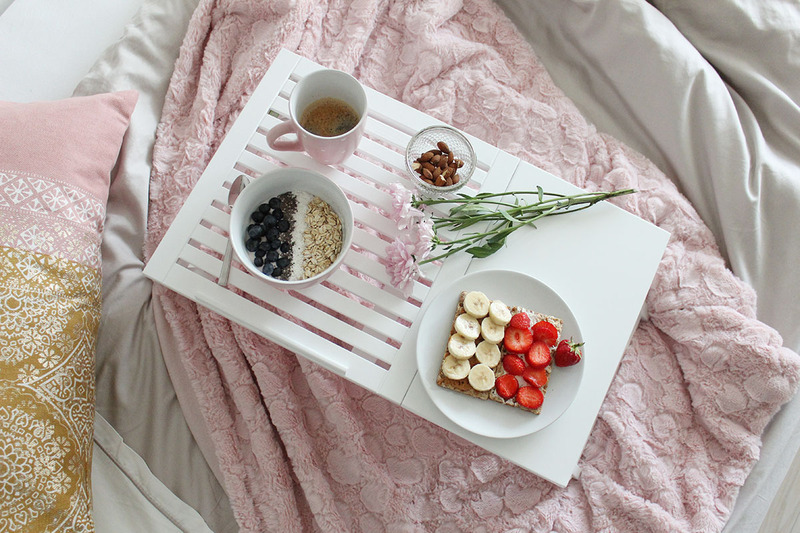 The ultimate breakfast in bed gadget: A breakfast table! Too many times – seriously – too many times did I spill my tea or coffee over my bed. Too many times I found some leftover crumbles of a cookie I had eaten in bed. Bad habits, people! Enough, you simply cant do that with the good linen and bed cover you have invested in. 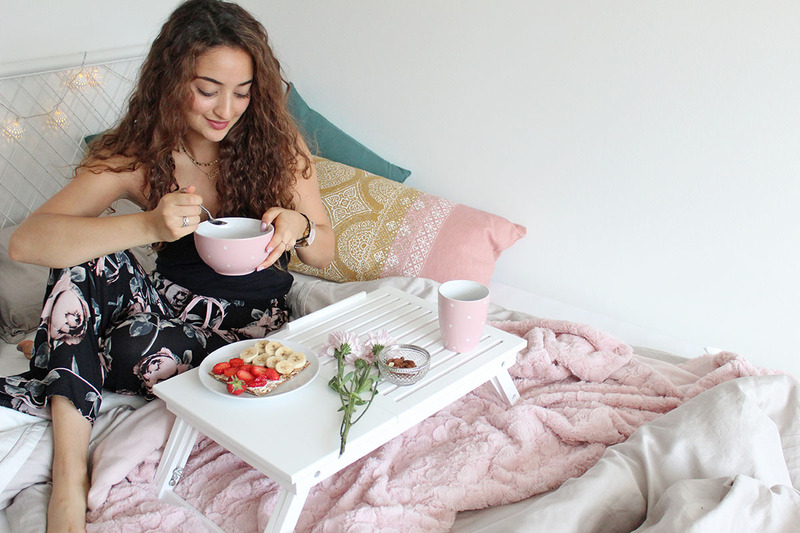 For a luxurious breakfast in bed you definitely need a proper breakfast table to avoid a breakfast on your bed… So thanks to Wayfair for solving my little struggle and sending me this super cool breakfast table from Zeller Present. It’s super practical, since you can adjust the height of its legs, plus it’s possible to tilt one half of the table to put a book or a tablet on it. In general, this breakfast table can also be used as a laptop table, if you want to work straight out of bed! 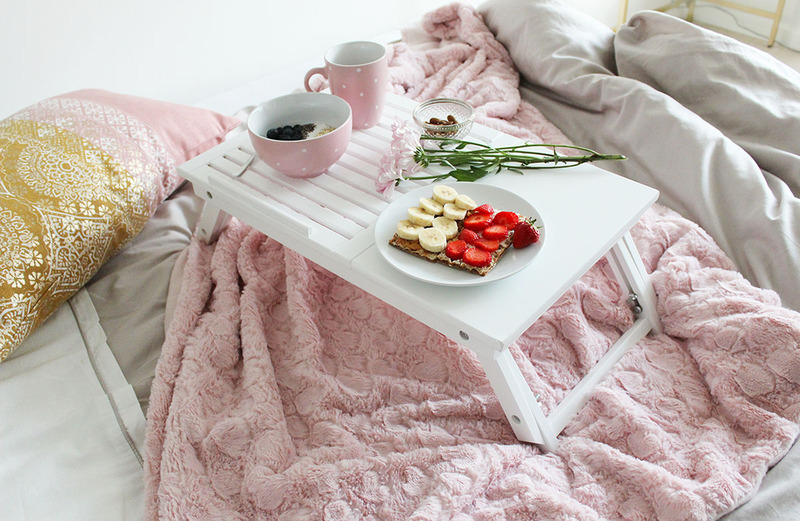 Unfortunately you need to get out of your bed first and prepare your food before you can go back in and enjoy your breakfast in bed. Well, unless you can get someone to do it for you! I actually don’t mind preparing my breakfast on my own. In fact, I think it is the only meal I actually like preparing for myself, haha. While my lunch and dinner cooking skills are rather mediocre, I can say I am pretty good at creating breakfast! 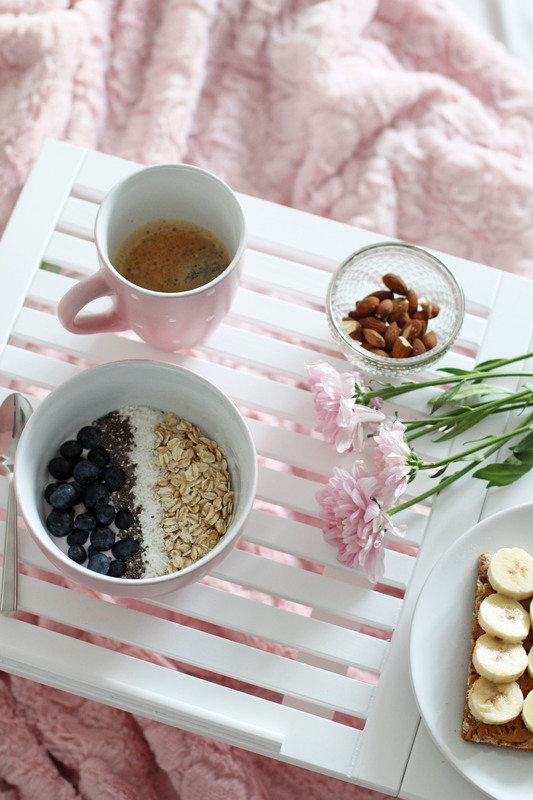 If you ask me what I prefer, I can definitely tell you that I am a sweet-breakfast-kind-of-person! Salty cheese on a breadroll? – Not for me. Mueseli-bowls, Acai-bowls, Croissants, fresh fruits and nuts – this is what I need for the perfect start into the day. 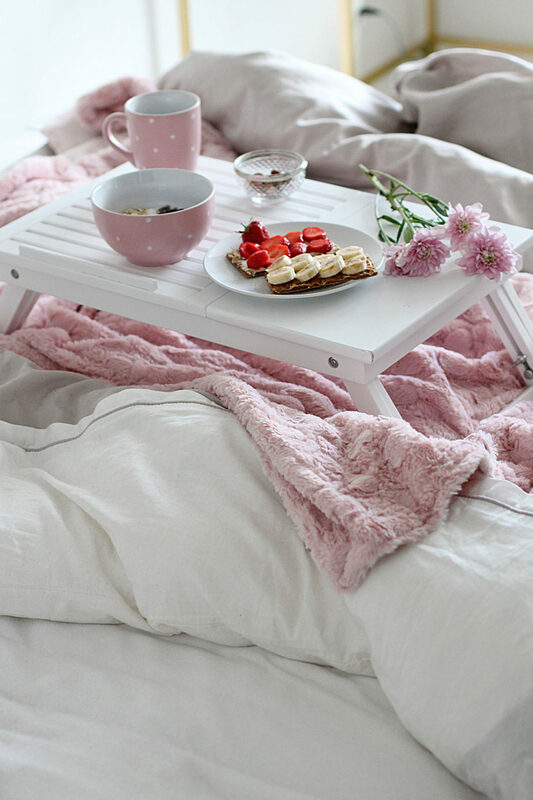 What makes this Sunday breakfast in bed luxurious? You might ask yourself why I call this Sunday breakfast “luxurious” – since nothing on the photos you see is really expensive. But for me luxury does not have to be something that costs a lot of money. Luxury is about how you feel about something – feeling good is luxury. 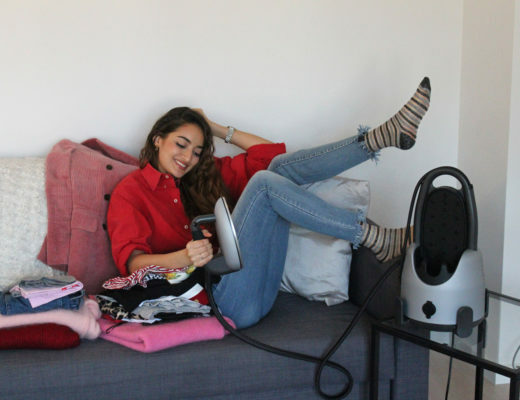 So even if it’s just a bouquet of flowers, your favorite peanut butter-banana sandwich or the coziness of your favorite sheets, all of this is a little bit of luxury if it makes you happy and comfortable. 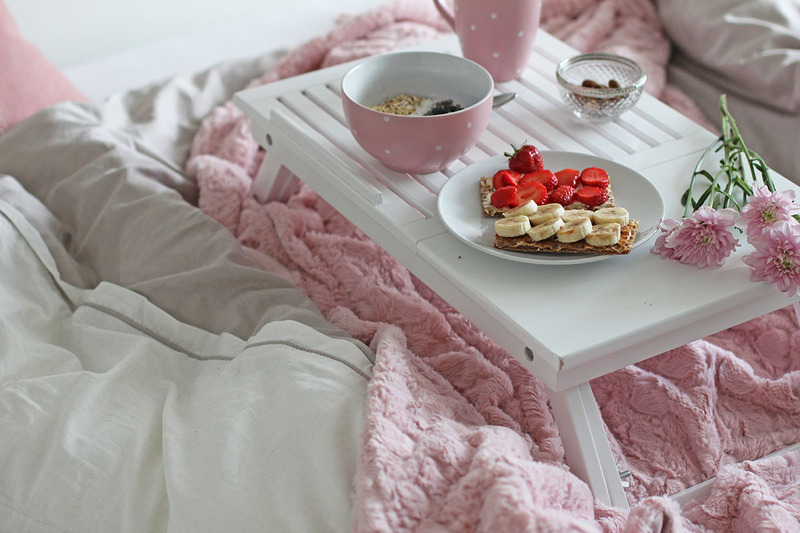 Time is luxury, which is why taking the time to prepare such a lovely breakfast in bed and really enjoying it is like fully exploiting the luxury. Try it and you will understand what I mean! Frühstück im Bett gibt es bei mir selten, aber es macht schon Spaß. Kaffee hingegen trinke ich öfter mal im Bett.